At the edge of our garden, just outside our bedroom window, is a tree. When we first moved into the house, about ten years ago, I had a chat with our new neighbour, who kindly pointed out Things That Needed To Be Done On A Regular Basis, and one of these Things was pollarding the trees. I’d never pollarded a tree before, but this sounded like ten types of fun, so for a few of the following summers we arranged aday, lined up ladders on both sides of the tree and clipped the new branches back, while having manly chats about work, families, and, very possibly, football. I discovered in this process that a) I didn’t really care for the whole tree surgery lark, and that this was related to b) I absolutely hated going up ladders, particularly if at the top of the ladder you had to use both hands to operate garden tools. 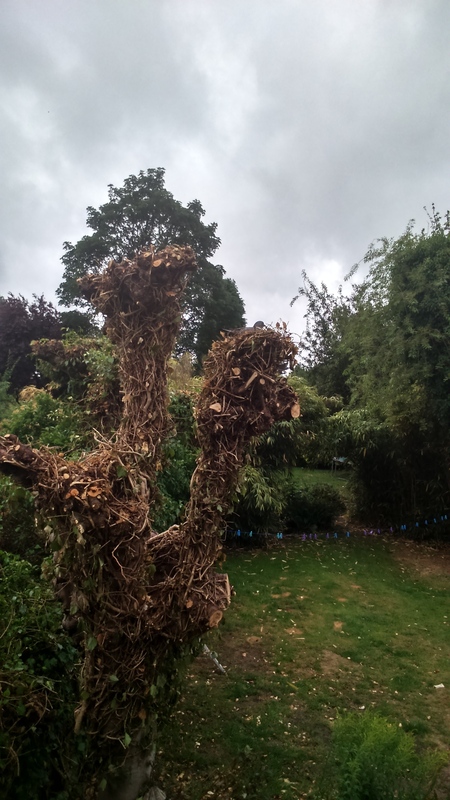 Anyway, after the first few years, our conversation over the fence dwindled to ‘we must get round to sorting that tree out’ and the, in the last few years, petered out altogether. And so it was, that one bright summer morning last month, I pointed out to my friend G that there was absolutely no light coming into our garden. And that it was all the fault of this bloody tree. ‘I shall phone a tree surgeon’, I said, and did. A couple of fruitless calls later (for some reason, tree surgeons are really busy in the summer, not to mention a tad pricey, but I don’t suppose they get much indoor work in the winter), I contacted G.
‘I would like to borrow your ladders’, I said, I like to think with the air of someone who knows one end of a ladder from another. ‘Ok’ he replied, with the air of someone who has known me long enough to know that I simply do not KOEOALFA, ‘but you’ll probably break your neck’. Nicely stating, in a single text, his position as alpha male in our relationship. Then restating, with particular reference to power tools. There was only one problem, and if you zoom in to the top part of the tree, you’ll be able to see for yourself. 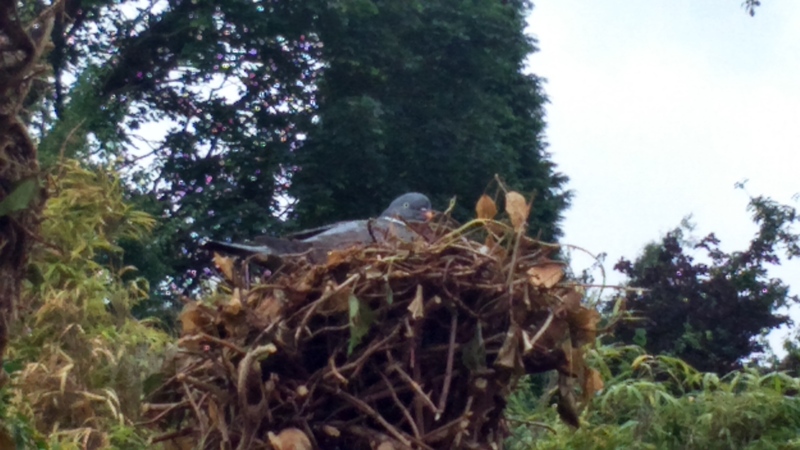 ‘There’s a nest with an egg at the top of the tree’, said G, and just as he was speaking, a large pigeon flew in and landed on the nest. To be fair, up and till now, she’d had a reasonably comfortable life, surrounded by leafy greenery, just popping out now and then for a quick worm before coming back to sit on her egg, then some bloke in a checked shirt had shinned up a long ladder with a chainsaw, and hacked away every half inch of protection. To make it worse, it started to rain. It rained, on and off for about a week, before Mrs E finally snapped. Mrs E is a patient and tolerant woman, and like many of the p&t of this world, has a snapping point, which is audible across multiple parishes. Certain activities are guaranteed to create this snapping point, including inappropriate use of the public highway, online payment systems, and leaving the toilet seat up. And, apparently, water damage to pigeons. ‘It’s just so cruel’, she sobbed, looking up mournfully and dabbing her eyes with an Edwardian handkerchief (for those of you who have met my wife, you’ll realise I’m making some of this up), ‘she’s getting so…wet. All she wants to do is sit on her egg. You’ll have to do something’. And do something I did, but first, a contextual tangent…. After a few days of the pigeon being exposed to the elements, the two younger kids had named her ‘Speckled Jill’, in homage to Colonel Melchett’s ‘Speckled Jim’, in ‘Blackadder Goes Forth’. As with many of the naming ceremonies in our household, I wasn’t allowed a look in, and she was Speckled Jill before I had any sort of a chance to submit my request to the naming committee. Had I not missed my slot, I would have definitely put forward a case for her to be called ‘Pride Of The East 2’. You see, me and pigeons go back through generations, and I like to think I have the same sort of reflected fame in pigeon racing circles as, say, George Stevenson’s great great grandson might have to trainspotters. Because, in 1929, my Great Uncle Bill won the National Flying Club trophy (presented by the King, no less) for the annual race from San Sebastian to England. Or, more to the point, his pigeon, ‘Pride Of The East’ did. To put this in an athletic context, this involved POTE knocking out an average speed of 1024 yards per minute, over 629 miles, until he fluttered gratefully and gracefully over the garden in Wickham Market and was bundled into the timing box. I make this about 35 miles per hour, over about 18 hours – Usain Bolt does about 27 mph, tops, and I really doubt he could keep going for 18 hours. POTE beat 1915 other birds, and Great Uncle Bill received not only a silver cup, but also a cheque for £120. That might not sound that much, but in 1929 you’d have to go some to earn that in a year. So, me and pigeons, we go back, right? And when Great Uncle Bill’s legacy and my wife’s desperate calls for a mother to be protected are combined, there is nothing for it, but for the Emu to spring into action. And S into A I certainly did,with the help of #4, and we soon had a roof made up, painted, and ready for inspection. I was pretty proud of this construction, as far as my DIY skills were concerned, and spend a while in the garage admiring it from various angles, before remembering that a) most bird houses these days are made by people with learning disabilities, so it wasn’t perhaps such an impressive construction and b) that I would still need to find a way of being fixed over the head of Speckled Jill, still resident and grumpy at c25ft above ground. Using all of the courage I could muster, I made my way up the ladder, balancing roof, support, nails, and hammer, and remembering to point out to my children where I’d filed my life insurance policy. Somehow, despite Speckled Jill’s lively protestations, the roof was duly put into place. I descended with a huge sigh of relief. ‘Splendid’, said my wife, which kind of made the whole exercise worthwhile, although there was a bit of an undertone of ‘thanks goodness I don’t have to take him to hospital this evening’. And now we wait. Speckled Jill looks every inch the expectant mother; her angry scowl has turned into a beatific gaze, as she no doubt thinks about the life ahead for her little one. All those hopes and dreams, eh? And, assuming all goes well, I’m putting in my request right now for the sprog to be called ‘Pride Of The East 2’. I think that’s been suitably earned. I’ve never seen a baby pigeon before. According to G, they’re pig ugly, and look like little dinosaurs. Also, apparently, they make a stupidly loud racket, all the time, and, remember, both mother and child will be neatly positioned just outside our bedroom window. But at least we’ll all be dry.